Barbara Strozzi was the adopted and probably illegitimate child of Giulio Strozzi, a Venetian librettist and dramatist who collaborated with the opera composer Monteverdi. Strozzi arranged for Barbara to train in music, hiring Monteverdi’s student, Francesco Cavalli, as her tutor. 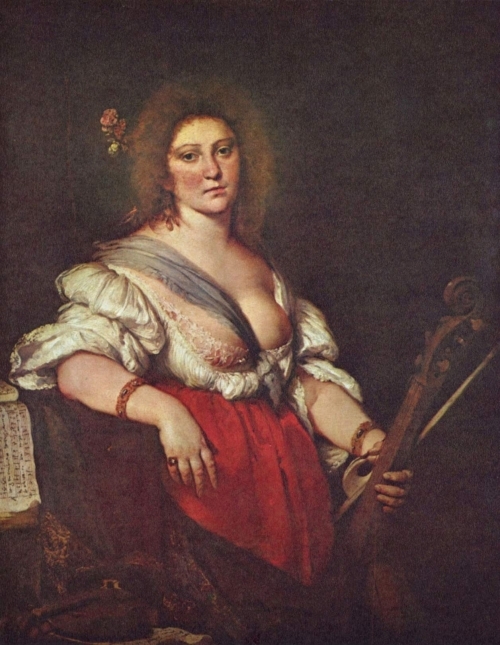 In 1637, Strozzi founded the Accademia degli Unisoni, a musical salon that met in the Strozzi home and showcased Barbara’s talents as a singer and composer of arias and cantatas for solo voice. Barbara’s career was thus launched along a particular path, as a maker of music for private consumption in domestic settings, rather than a court performer or concertist. From 1644 to 1664, she published eight volumes of compositions, seven of which survive. Together her works constitute a significant contribution to early Baroque music. Strozzi led an unconventional life: she remained single but had four children, all most likely by her married lover, Giovanni Paolo Vidman. Three of her children joined monastic communities.